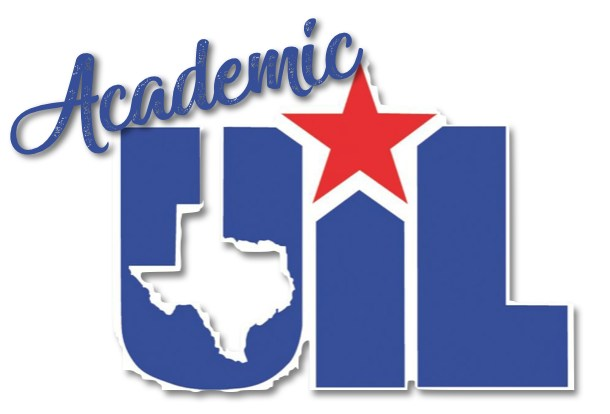 Academic UIL gives students a chance to learn, make connections with peers, receive guidance from teachers, and have experience applying their knowledge with students from other schools. Team members participate in competitions in various content areas including Math, Science, Language Arts, Social Studies and Art knowledge. Summaries of the events and the competition day's schedule are at the bottom of this page. Please see the conflict pattern attached on the right to see which events happen at the same time on the day of the meet. When is the UIL Meet? Where is the UIL Meet? ORDER YOUR 2019 UIL T-SHIRT! This years UIL T-Shirt design is done! Parents and Students please complete this online UIL Permission Slip for each student that will be participating. Selection Process: You need to attend the first practice (see below) to receive details about each subject's practices and selection process. You must contact each event's coach directly to receive information about practice schedules and selection process. Students selected to represent our school at the competition will be notified by the coaches; practice dates/times will be shared with students at that time. 5th and 6th will meet with during advisory time on Tuesdays and Thursdays from Feb. 19-April 11, but not Tues., March 5. 7th and 8th grade will meet from 3:15-3:55 Tuesdays and Thursdays from Feb. 19-April 11, but NOT on Tuesday, March 5. Practices will be on Tuesday mornings at 7:30 in B128. *Practices will be held on Thursday afternoons from 3:45-4:15. Interested students will want to view the website at tinyurl.com/UILspeak BEFORE tryouts to learn more about the topics and sign up for the tryouts. Please bring a poem to read for your audition. This contest involves the study of paintings from the National Gallery of Art in Washington, D.C. and paintings or pictures from selected Texas museums. As part of their study, students will demonstrate an understanding of art history and interpret ideas and moods in original artworks while making informed judgments about the artwork. Part A of the contest requires the contestant to identify the names of 15 selected artists and titles of pictures selected randomly by the director from the official list of 40 pictures. Part B consists of 30 questions about art history and art elements characteristic of the 40 art selections. The calculator applications contest is designed to stimulate the development of mathematical and calculator skills for students in grade 6,7 and 8. Goals are both intellectual and practical: developing mathematical reasoning and knowledge and requiring the application of problem-solving skills toward realistic problems. Students will take a test containing 80 problems in 30 minutes. The contest consists of problems which may include calculations involving addition, subtraction, multiplication, division, roots, and powers. It also includes straight-forward calculation problems, and simple geometric and stated problems similar to those found in recently adopted textbooks. Each division will take a 30-minute objective test plus a separate 5-minute tiebreaker section. All Chess Puzzle test questions are now multiple-choice format, to allow for a broader scope of questions and increase the educational value of the contest. Thorough knowledge of the dictionary is a way to increase a student's ability to find the information that is needed for classwork as well as everyday living. Each Dictionary Skills test consists of 40 objective and short answer questions to be completed in 20 minutes. Contestants use dictionaries during the competition, which may be tabbed. Contest questions cover word origins and histories, parts of speech, pronunciation, variant spellings, plurals, alphabetizing and other such elements. Test questions are also taken from charts, tables and lists contained in the dictionary. The Editorial Writing Contest is designed to develop the persuasive writing skills of the participants. Students must advocate a specific point-of-view in response to a prompt. Sixth, seventh and eighth-grade students have 45 minutes in which to complete their editorials. This event takes place at school prior to the day of the meet. This contest provides opportunities for students in grades 6, 7 and 8 to evaluate speeches given by others; to explore the use of the voice and body in speaking situations; to examine the different purposes for speaking; to organize ideas; to prepare and deliver various speeches; and to develop self-confidence. The maximum time limit for each speech is five minutes. There is no minimum time limit. Students who exceed the allotted five minutes shall be penalized one rank. The listening contest is designed to help students in grades 5,6,7 and 8 recognize the importance of effective listening skills and to identify problems they may have in listening effectively. It also provides a challenging format to test the improvement of their listening abilities. Through preparation for the contest, participants will listen actively to a variety of material and learn to analyze and evaluate a speaker's message critically. Tests will include, but not necessarily be limited to, language arts, fine arts, natural sciences and social studies. The objective tests will measure skills such as identifying the main idea and supporting ideas, drawing conclusions, distinguishing fact from opinion, and mastering other listening and thinking skills. Students will be given an objective test containing approximately 75 multiple choice, true/false, and fill-in-the-blank questions which must be answered in 45 minutes. Students begin taking math in elementary school and continue taking it in high school. Learning to complete math problems quickly is a valuable skill in all facets of life including engineering, accounting, completing a tax return and even grocery shopping. This contest includes problems covering, but not limited to: numeration systems, arithmetic operations involving whole numbers, integers, fractions, decimals, exponents, order of operations, probability, statistics, number theory, simple interest, measurements and conversions. Geometry and algebra problems may be included as appropriate for the grade level. The contest, designed for students in grade 6, 7 and 8, consists of 50 multiple choice problems. In Modern Oratory, the sixth, seventh and eighth-grade contestants will select one of the topics, determine the critical issues in the topic, and acknowledge both pro and con points citing support discovered in their research. Students will choose a side they will defend and support that side with additional evidence. Along with the skills of analysis, research, note-taking, documentation, evaluation and decision-making come those of delivery and the skill of memorization. The focus of the Music Memory contest is an in-depth study of fine pieces of music literature taken from a wide spectrum of music genres to expose students to great composers, their lives and their music. In the course of preparing for the contest, students should be given the opportunity to describe and analyze the music, relate the music to history, to society and to culture, and to evaluate musical performance. To receive full credit for an answer, all information about the music selection must be complete as shown on the official list. Spelling and punctuation are considered in the grading of this contest. Individuals are called upon every day to use their ability to make quick mental calculations to make decisions. The development of such abilities should be an integral part of the math curriculum. Concepts covered include, but are not limited to: addition, subtraction, multiplication, division, proportions, and use of mathematics notation. Reading literature out loud provides opportunities for students to analyze the text, to grow and to develop as a performer, to communicate a message to an audience and to perform an artistic creation. The oral reading competition should be an extension of the classroom literary and language arts activities in poetry, short stories and children's fiction. See the link below for frequently asked questions about oral reading. Students read a selection of poetry. Each selection may be one poem, a cutting of a poem, or a combination of poems. The same selection may be read in all rounds, but different selections are permissible. Selections must be published although the poet may be unknown or anonymous. Texas has put a great emphasis on writing skills at all levels of school and all levels of state-wide testing. Ready Writing builds upon those skills and helps students refine their writing abilities. In particular, this contest helps them to learn to write clearly and correctly a paper that is interesting and original. A standard dictionary or thesaurus may be used during the contest. persuasion -- describe and argue just one side of an issue; describe both sides of an issue then argue only one side; write an editorial; write a letter to persuade, etc. There is no minimum or maximum number of words the contestants must write. Emphasis for the Science contest, for students in seventh and eighth grades, will be placed on knowledge of scientific fact, understanding of scientific principles and the ability to think through scientific problems. The contest was designed to test not only memory but the ability to critically think about science and scientific processes and concepts. Such concepts include, but are not limited to: matter and energy, equilibrium, force and motion, physical and chemical properties, the relationship between organisms and the environment, the components of our solar system, the composition of matter and genetics. The contest will build upon the vast body of changing and increasing knowledge described by physical, mathematical, and conceptual models. Each test will consist of approximately 35 multiple choice questions which will be taken from current state-adopted science textbooks and the curriculum. Test topics defined by a study outline that is updated each year. - Grades 5 and 6: 80 words; tiebreaker, 20 words. - Grades 7 and 8: 110 words; tiebreaker, 30 words. Contact Racheal Cotton (cottonr@hpisd.org) with any questions.